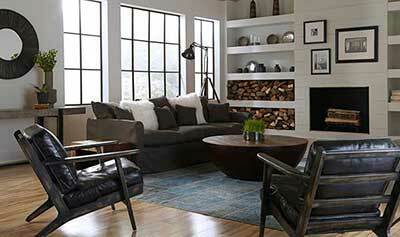 Redesigning a room can be a daunting task for anyone. To help keep your angst levels at a minimum, here is a plan to transform your space quickly and easily. Focus on one room at a time. Transforming your whole house at once is normally not practical and will leave you feeling frustrated and overwhelmed. Remember how you eat an elephant – one bite at a time! Define what the room will be used for. Once you clearly outline exactly what you want to take place in the space, all the pieces will align more easily. Is this a room for reading and relaxing, or is this a family room with a 70-inch flat screen where you need space for the nightly family Wii fest? When you define how the room will be used you will be able to quickly determine pieces that you may need to purchase or dispose of. Take inventory of what you have. When you’ve owned something for a long time, you tend to forget just how beautiful or ugly it is. Now is a good time to take a step back and see what can be repurposed, transformed, moved to a new place, given away, or burned. Get rid of what you hate. We all have a tendency to hang on to things that have outlived their usefulness. Our possessions should serve us well and bring us joy. If they do not, it’s time for them to go make someone else happy. Measure the room. That includes doorways, windows, fireplace width, the distance between the window or door from the ceiling, the wall or the next opening. Measure the pieces you intend to keep – length, width, height, and depth. You get it – make note of every dimension so you can make good editing choices. Not only do you need to know what size furniture the room can accommodate, you need to know if new pieces can pass through any doorways and staircases on the way in. Plot the room to scale. 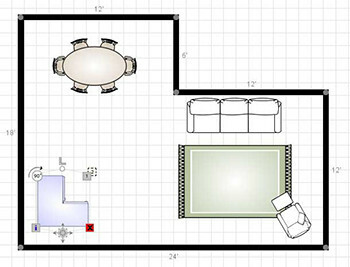 This is very easy with the plethora of room planning programs available for free online. Using the planning software will allow you to start experimenting with placement and traffic flow so you can finalize what additional pieces you will need to add. Look in your closet to choose your color palette. The colors you wear the most will make you the happiest to see day in and day out. Build an idea board. Tear out magazine pages that show placement, color, shape, fabric use, or any design elements that appeal to you. You’ll be impressed with how quickly you can determine the room’s outcome by physically laying out some images. Sometimes it is just easier to have the visuals all together in front of you. Don’t hem yourself in with the mindset that the room must be completely finalized at a set point. The best spaces evolve over time and have the benefit of several edits. Truly great rooms have layers; let those layers unfold to you. You may edit and re-edit many times before you find perfection, or you may be like Thomas Jefferson and spend a life time pursuing perfection. Either way – enjoy the process!